andrea joseph's sketchblog: where were you when we were getting high? 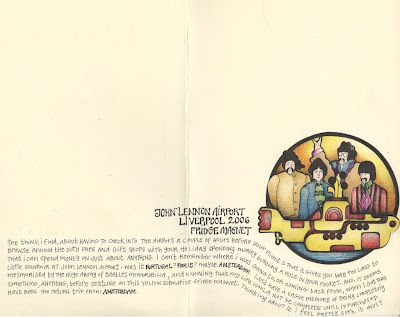 **we all live in a yellow submarine**......cool start to your new book...I love your art! What happened to the post with the inside cover? I loved that rambling about bringing something home from a trip that becomes a part of your life. I think that it's a great way to remember those special experiences (except for Egypt in your case). i love the idea of themed sketchbooks, i've tried but rarely succeed with staying on course. your work is always a pleasure to view, and i love your rambling! I love when you blog in your moleskines! We get a look into your thoughts of a particular drawing or event ... it's a fun journey you take us on, regardless of a trip down memory lane or a look at your multiple collections. :) Hmm, I wonder where to next? I like your page. For a beader's take on the yellow submarine check out The Lone Beaders blog here and her finished piece here.I think you might enjoy her work and blog. Your art is like a warm soft blanket, I have had a pants day in Preston, come home and log on and all is well in the world. It makes me smile and envious, so wish I could do it as well as you. Love it! so, to resume, u gt messy house, wear funny passed out shoes and u'r drugged. i'm really curious to see u'r next release..
sure she gt trendy shoes! dt ask for quotat° u'll draw a rope. I hardly think that they ALL lived in that yellow submarine. I can't imagine what the smell would be like. Another nice piece of art work Andrea. How does one get in on this traveling moleskin fun? Matt, I didn't like the drawing. The ramblings were ok, but the drawing let it down. Freebird and G, GREAT links. I loved them both. Goodness -- so i spent most of the day with "All Together Now" by the Beatles stuck in my head. And here it is -- the album it is from. What a beautiful spread, Andrea. Oh, and I heard John Lennon's version of "Stand By Me" this morning in a store. I had not heard it in years. It felt great. Andrea, I can completely understand how you feel when you see something that you must have. It always happens to me, especially with art books and music... I see a cool image or I hear a cool song and that's it, I'm done! Great drawing as always!